Three little Cajun animals plan and host a party for their friends with all their favorite food and music. Their plan takes a devastating turn when a storm comes along, and they are forced to deal with the circumstances. Read along and discover the struggles they face, the attitudes they are challenged to adopt, and the victories they encounter by the positive choices that are made. 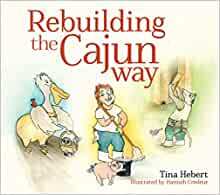 Staged in South Louisiana, Rebuilding the Cajun Way is an entertaining children's book for elementary children ages 5 years to 10 years of age, and the story educates children about the Cajun landscape, hospitality, and delicious food while learning the lessons contained within. Start reading Rebuilding the Cajun Way on your Kindle in under a minute. 5.0 out of 5 starsCute Cajun book. Loved it! Cute story! Great gift for my girls. They love it! 5.0 out of 5 starsAdorable book! Quite an adorable book about neighbors helping neighbors before, during, and after a storm/flood. The illustrations are fun, and the story encompasses the full event from pre-storm life to post-storm cleanup. Cajun terms are sprinkled throughout--but never fear! The book wisely contains a glossary complete with pronunciation guide (thank you, author & publisher!). The topic is gently presented so it's appropriate for a broad range of little ones, but the reality of the fear and the post-storm mess are present within the story. If your child experienced a natural disaster and you want to help them see how people help each other, or if you want to introduce children to the fears and realities of those who go through it without overwhelming them, this is a good resource.